And it was a disappointment. But let me start from the beginning. When Halcyon Digest came out, I wasn’t into it. But because I want to give all records a chance I had been listening to it again and again, and it quickly became more than an interest of mine. A close friend fell in love with it, it was on all the time and never bothered me. When I went back to listen to Halcyon Digest to “prep” (if you will) for their new release, Monomania, I found myself skipping forward. Is this due to boredom? Or loss of interest? How can this happen, you might ask, on such a diverse, well put together record of new sounds? Well, it can. Last night I saw a lot of things I want to talk about, but the words Hype Machine come to mind the quickest. 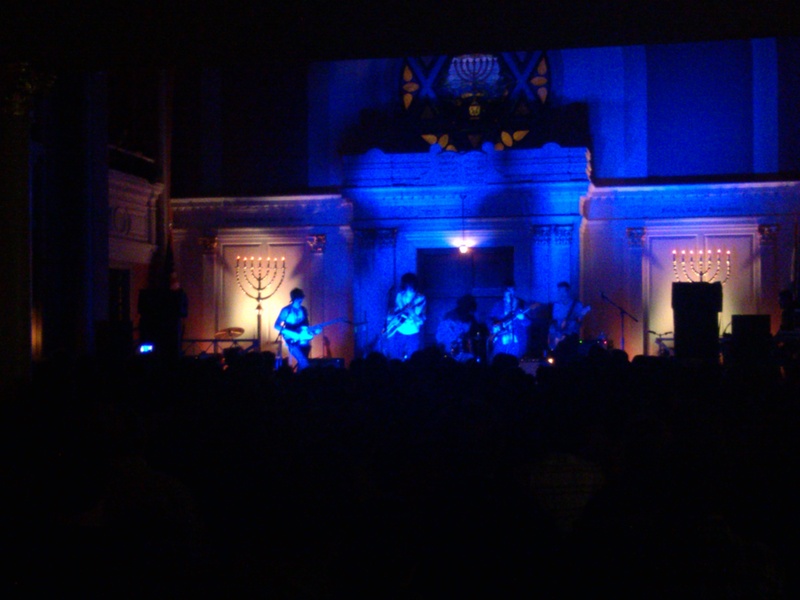 Deerhunter played at Washington, DC’s Sixth and I Synagogue. While I don’t spend a lot of time in places of worship (and I have a lot of opinions on that, that will stand alone) I am familiar with the idea of a band playing in a church basement because, hey, we’ve all been there and we’ve all been 14. But once I finally arrived and saw that the stage was, what I know as “the alter”, the only lights they had were flashing primary colors and the two manuras that were flickering on each side of the stage I became aware of the pews that were preventing those with small bladders and huge thirsts from enjoying the concert. What a terrible way to watch a band. Since I arrived late, I assume the band I caught the edge of was Jackson Scott. They were doing all right until they went to psych-break-it-down and never brought the original melody back. I couldn’t tell what it was about them: if they were so full of themselves or unsure of themselves. Their drummer reminded me of Blake Anderson from Workaholics and their dress of over-sized plain cotton t-shirts, sweatpants and sneakers made me think of (what I’ve read) of Olympia, WA and early Nirvana. They did a good job but played too long. Which was only because Deerhunter hadn’t arrived yet. The biggest issue for me, as it should be for everyone, was the sound. Now this Synagogue was beautiful. It had everything going for it – that I assume – Synagogues would want. Perfect for orchestral arrangements and the sort. But if you haven’t heard, Deerhunter isn’t an orchestral band. They play events like The Austin Psych Fest. They’re droners. This wasn’t the ideal place for any of this to be happening. And performing at the center of a religious platform, while entertaining in thought, was actually quite creepy at times. Sixth and I is a tube inside. There was no place for all the reverb rock to go. I said it before and I’ll say it again, “all echo and no absorption makes Sarah a dull girl…” I was excited at the thought of witnessing something cool (enter Hype Machine). Lately, Bradford Cox has taken on the new androgynous role of wearing a wig and generally looking like a woman. (Actually, the photo in this link is what he was wearing.) But his cross dressing skills are hard to pull off because of how skinny he is. It is worrisome how thin Cox is. And all I could think about the whole time is, “Why Are You So God Damned Skinny? ?” [Editor’s note: our dear Internet friend, Andy, knows why.) Encountering thin men singing rock music isn’t new to me. Ariel Pink’s show wasn’t as weird as this and he’s not even as thin as Cox. Chew on that. Now enter the music, problem #2. No one seemed to mind that the band was 45 minutes late to their start time. And ESPECIALLY no one seemed to mind that they did a sound check with music playing the whole time. Now, I’m not trying to be Nancy Negative here, but when you are testing your band’s sound I’m pretty sure it’s cool to get a good sound check in. During, I was thinking that watching a sound check is like the credits rolling before the movie starts. It should be a romantic, easy effort. But with Americana Rockabilly playing in the background the whole time, you probably won’t get that guitar to sound just how you like it. There might’ve been feedback a lot of the time – or that could’ve been the set itself – I could not tell. I am not a Deerhunter discography aficionado. And seeing any live band who’s music you aren’t familiar with isn’t really ideal. Or at least, it’s not as fun. I stayed around to hear them open with a 10 minute drone of the same chord over and over to break into a song I didn’t recognize, that didn’t get better. Then, they played a few more and eventually got to a few hits from Halcyon Digest like “Revival” and another one (or two) that I cannot name because they are all blending together. It was when Bradford Cox was struggling with his wig too much and unable to focus on playing his guitar that I lost interest. Heading for the restroom, I thought maybe I’d catch a second wind when I came back. But all I wanted to do was yell mean things. As much as I like to make snide comments, I haven’t gotten as far as yelling them out in public. I figure, these people can do something I cannot. So I’ll clap, but that’s all I got. The whole SCENE was very cool. There were a lot of unusual people there and a lot of people who dressed like the dad from Clarissa Explains It All. The vibe of performing at the center of a Synagogue is very – well, vibe-y. The band was into what they were doing, but all I could do was look up at the dome knowing that half of what I was hearing was off because of the nature of the building. The most consistent thing seemed to be the visuals: there were cool shadows of themselves projected the whole time, in blues, red, green and yellows. 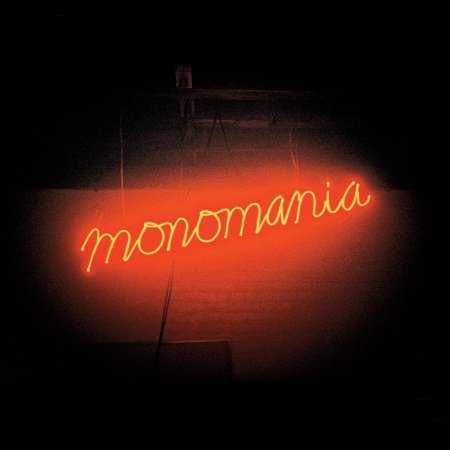 Deerhunter’s newest record Monomania leaked and has been passed around the Internet already. The Hype Machine itself is in full force now, and until the record is out legally – on May 7th on 4AD – I can’t help but think…is Bradford Cox going androgynous like Bowie and Lou Reed because it is who he is and all else be damned? Or is it part of the “Mono” gag for the record? Maybe because Halcyon captured the hearts of so many, we’re at the phase where we let him do what he wants? I am unsure. Anyways, the whole night was brought to you in part by WVAU – the college station of American University. I went to support the general manager, Emily White, whom I befriended on twitter. She is a nice person and works very hard. I also will always have a place in my heart for college radio. I love supporting all its’ efforts (and so should you). So, even though this show wasn’t for me, a lot of people enjoyed it. (I think? I overheard other people leaving, one girl commenting, “I think the sitting down changed it for me….”). Either way, cheers to WVAU, Ms. White and her staff that made it happen. And until this so-so record is actually released, try to make up your mind about it because I can’t. Pingback: The Mountain Goats May Have Put On the Best Alternative Show I’ve Ever Seen. | Electric Comic Book.